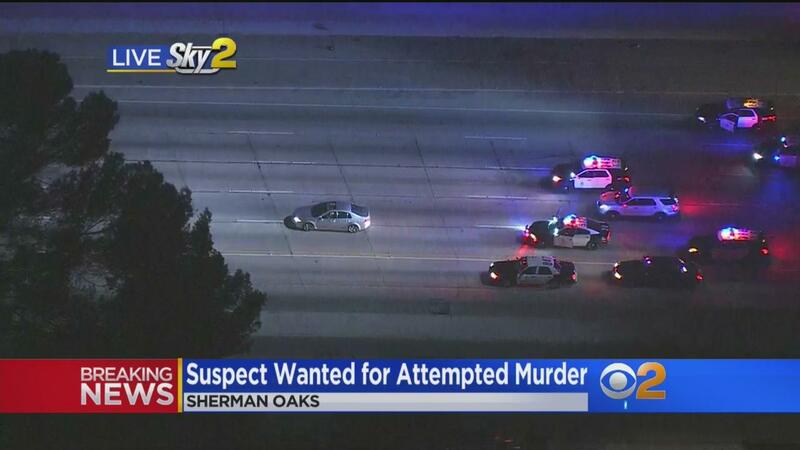 LOS ANGELES — A California freeway was shut down for two hours Monday night as police pursued a man wanted for attempted murder, reports CBS Los Angeles. The slow-moving chase was recorded on aerial video, which showed officers at one point performing a pit maneuver — bumping the back corner of suspect Marcos Tulio Flores’ vehicle, causing him to swerve. Flores allegedly fired his weapon at the officers repeatedly as they chased. Two armored vehicles ultimately ended the chase when they collided with the the suspect’s car. A K-9 and an army officers then collapsed around the suspect. Flores, described as a documented gang member, is suspected of shooting a 36-year-old who remains hospitalized in critical condition, police said. A motive for the shooting has not been disclosed.